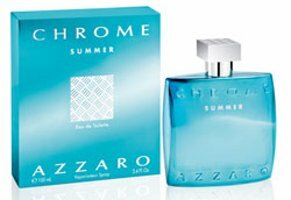 Azzaro will launch Chrome Summer, a new limited edition fresh aquatic fragrance for men, in April. Chrome Summer is a flanker to 1996's Chrome, and follows last year's Chrome Sport. Like Chrome Sport, Chrome Summer was developed by perfumer Michel Almairac; the notes include grapefruit, cardamom, rosewood and amber. Azzaro Chrome Summer will be available in 100 ml Eau de Toilette. I think Azzaro does well with the Chrome line. Perfume lovers can’t help but laugh at this. Not to be cynical, but I guess if I owned the company I’d do the same thing. Because I have worked for two major perfume houses, I have tons of perfume. If I didn’t, I would wear Chrome. I anticipate trying this one with great excitement! I like Chrome Sport too. I don’t dig on aquatic-y sporty scents on men. They already came out with the Sport one…oh I guess it was bound to happen. I guess I’ll sniff it..but I can tell I probably won’t care for it.